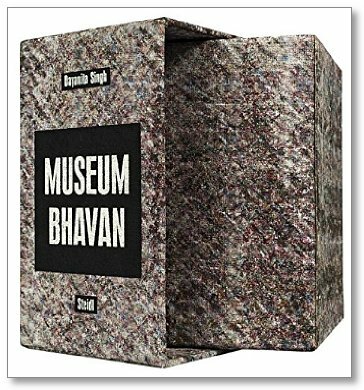 Book Review Museum Bhavan By Dayanita Singh Reviewed by Adam Bell Dayanita Singh's latest project blends her museums with books. Museum Bhavan By Dayanita Singh. Steidl, 2017. Photographs by Dayanita Singh. Contributions by Aveen Sen and Gerhard Steidl. Steidl, Gottingen, Germany, 2017. 298 pp., 241 black-and-white illustrations, 4¾x6½x4¾". Museums are born of an urge to collect, gather, preserve, and make sense. Rearranged and brought together under various categories and criteria, their objects can tell us stories about others and ourselves, but they are just as often idiosyncratic and personal, reflecting the culture and people involved. Meanings are disclosed just as often as they are obscured. Photography is driven by a similarly compulsive urge. Pointing at things and people, it catalogs and collects the world and its things, but is forever bound to its author. Described as a “book-object,” Dayanita Singh’s 10-volume box set, Museum Bhavan, is really a hybrid catalog-book-display object. Offering an intimate look at Singh’s life and concerns, Museum Bhavan is a private museum made public, reflecting not only Singh’s attempts to make sense of her work and expansive archive, but also offering a poetic meditation on the medium and its rich possibilities to order and construct meaning from the past and the world around us. Arranged into lyrically titled volumes, like the Ongoing Museum or Museum of Vitrines, Museum Bhavan began and also exists as an exhibition. As a show, the work consists of nine groups of images housed in moveable wooden structures, which are translated here into small, individual accordion books. 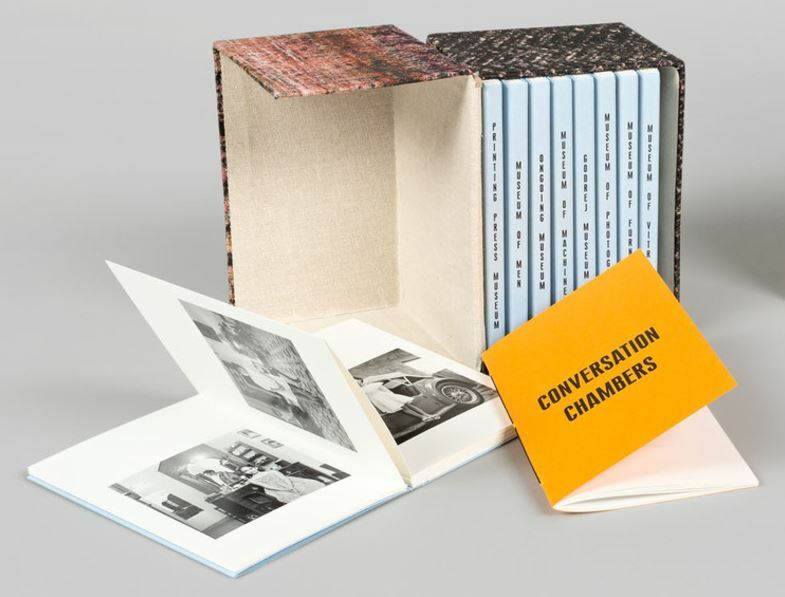 Accompanying the books is a tenth volume, entitled “Conversation Chambers,” which contains extended interviews with Singh by the publisher Gerhard Steidl and the writer and curator Aveek Sen. The books contain a wide range of work by Singh from 1981 to the present, but are not arranged chronologically and are instead thematically grouped and sequenced. Images of interiors, furniture and machines are grouped and parallel pictures of family and friends. People appear and reappear in various “museums,” often decades apart, conflating time, bringing the past forward into the present. Just as there are temporal threads uniting the work, similar images appear in what might be unrelated “museums,” connecting each individual volume together as a whole. If museums are designed to preserve and gather the past, both Singh’s choice of subject matter and project feel very apt. 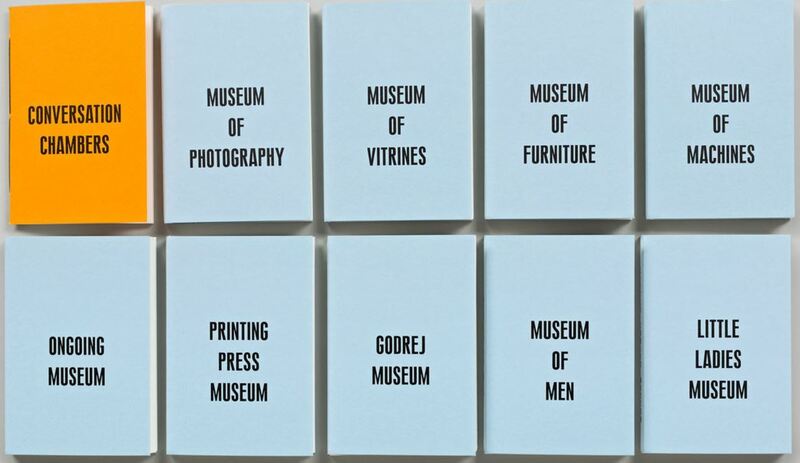 In Printing Press Museum, Singh documents antique printing presses in various locations. While there is one image of Gerhard Steidl sitting at his desk in Germany, surrounded by papers and books, the remaining images show antiquated presses, long since taken out of commission, on display or tucked in the corners of rooms. As in the Museum of Vitrines, an obvious reference to the innovative displays Singh uses in her work, the artist pays homage to the rich museological and press traditions of the Indian Subcontinent that she continues in her work. Although Singh is an artist committed to the book form and has jokingly referred to herself as an “offset artist,” she also explores unique methods of exhibiting her work that bridge the past and present. Musty archives, colonial museums, and preserved interiors at first seem anachronistic but Singh calls them forth into the present in both her images and methods of display, alerting us to their existence, importance and meaning. While books like Little Ladies Museum or Museum of Men gather portraits of family and friends, others exclude people for institutions, archives, and machines. Yet even when there is no one to be seen, a human presence is palpable. In the Museum of Furniture, arrangements of chairs suggest an intimate gathering. Likewise, in Museum of Machines vacant machines stand alert, ready to be put back to work. These more taxonomic books are contrasted with books whose meaning and categorical organization are less clear, like the Ongoing Museum, which gathers disparate photographs including screenshots of an Indian TV melodrama, a concert performance, interiors, portraits and more. Interestingly, some of the books have hidden or alternative names on their back covers. The Museum of Photography is also the Museum of the Departed, and the Ongoing Museum is also the Museum of Chance. These second titles not only offer hints at their meaning, but also suggest the mutability of the boundaries that hold any individual images in a given volume. Simultaneously a multi-volume set and object to be displayed, the individual books invite intimate scrutiny and are housed in unique cloth-bound boxes. While it’s unlikely most readers will display the books as Singh hopes—reshuffling them on a mantle or shelf in different configurations—the inventive yet restrained design is a delight and is reminiscent of Singh’s equally inventive Send A Letter.